The human innate immune system is indispensable for protection against potentially invasive microbial and viral pathogens, either neutralising them or containing their spread until effective mobilisation of the slower, adaptive (specific), immune response. Until fairly recently, it was believed that the human innate immune system possessed minimal discriminatory activity in the setting of a rather limited range of microbicidal or virucidal mechanisms. However, recent discoveries have revealed that the innate immune system possesses an array of novel pathogen recognition mechanisms, as well as a resourceful and effective alternative mechanism of phagocyte (predominantly neutrophil)-mediated, anti-infective activity known as NETosis. The process of NETosis involves an unusual type of programmed, purposeful cell death, resulting in the extracellular release of a web of chromatin heavily impregnated with antimicrobial proteins. These structures, known as neutrophil extracellular traps (NETs), immobilise and contribute to the eradication of microbial pathogens, ensuring that the anti-infective potential of neutrophils is sustained beyond the lifespan of these cells. The current review is focused on the mechanisms of NETosis and the role of this process in host defence. Other topics reviewed include the potential threats to human health posed by poorly controlled, excessive formation of NETs, specifically in relation to development of autoimmune and cardiovascular diseases, as well as exacerbation of acute and chronic inflammatory disorders of the airways. Until fairly recently, the protective activities of the human innate immune system, which are highly conserved throughout evolution, were thought to be achieved by a limited range of mechanisms with minimal discriminatory potential. Predominant amongst these mechanisms are the physical barriers presented by the skin and mucous membranes, engulfment and destruction of microbial and viral pathogens by resident and migratory phagocytes, and the non-specific antimicrobial activity of various blood and tissue proteins. These mechanisms either prevent infection or, in the case of a breach by a pathogen, contain the infection until adaptive (specific) host defences are effectively mobilised. Over the last decade, however, a number of significant discoveries have revealed that the human innate immune system not only possesses a level of discrimination previously considered improbable, but also includes additional, resourceful mechanisms of phagocyte-mediated antimicrobial and antiviral activity. In 2004, Brinkmann et al.3 described an unusual mechanism by which human blood neutrophils immobilise pathogens extracellularly, exposing them to a highly concentrated array of anti-infective proteins. Neutrophils (also known as granulocytes or polymorphonuclear leucocytes) are the predominant small circulating phagocytes. These cells have an estimated lifespan of 5.4 days in the circulation,4 which is longer when they are exposed to anti-apoptotic cytokines. These cells exit the circulation via transendothelial migration and chemotaxis to sites of microbial and viral infection where they phagocytose and destroy pathogens via intracellular exposure to microbicidal and virucidal reactive oxygen species (ROS), proteases and proteins. NETs form large extracellular barriers to bacterial dissemination, and provide a mechanism for localised concentration of effector molecules. 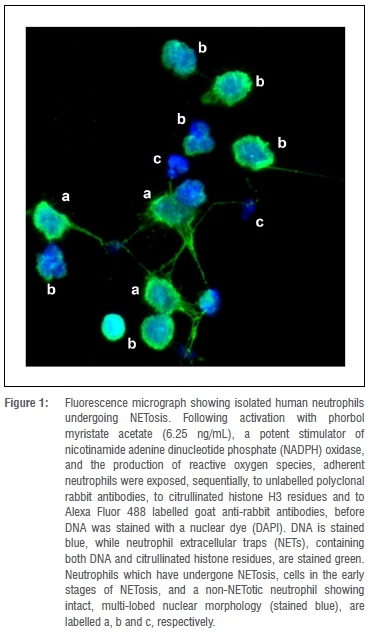 Importantly, NET formation has been demonstrated in both the clinical and experimental infection settings using immunohistochemistry and spinning disc vital microscopy.6 Several strategies to measure NET formation in vitro have also been described, including immunofluorescence and electron microscopic procedures, as well as spectrofluorimetric and other methods which detect extracellular DNA and associated granule proteins.3 Human neutrophils undergoing NETosis in vitro are shown in Figure 1. NETs are the topic of this review, which is focused on mechanisms of NETosis and the role of this process in host defence, as well as on the potentially harmful consequences of excessive NETosis for the host and possible pharmacological control strategies. The proposed mechanism of lytic NET formation based on current knowledge is shown in Figure 2. The DNA scaffolding of NETs is provided by decondensed nuclear chromatin. A variety of NET-associated proteins, predominantly highly negatively charged histones, is arranged on this scaffolding. Via their strong positive charge, histones facilitate the adhesion to, as well as the sequestration of, microbial and viral pathogens24 and also confer bactericidal activity, as does DNA.25 The remaining NET-associated proteins comprise granule, cytoplasmic and cytoskeletal proteins, as well as metabolic enzymes.24 The concept of a core NET-associated proteome that remains constant regardless of the specific agent responsible for NET induction, has been proposed by Rahman and Gadjeva26. The core NET-associated proteome is made up of a combination of 19 constituent proteins, arranged in association with a variety of decorative proteins. 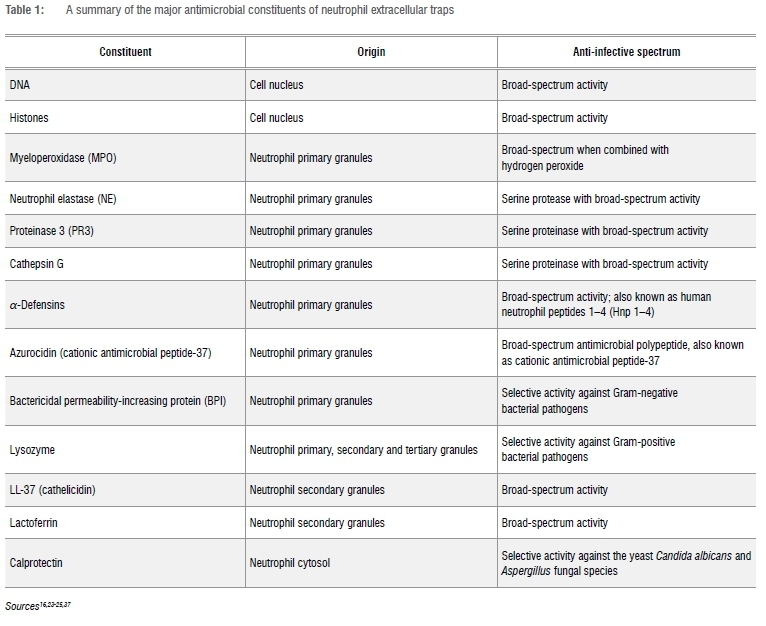 The fact that the protein structure of NETs exhibits a constant element to its composition supports the hypothesis that NET formation is indeed an innate immune system response which is non-specific.26 The major antimicrobial components of NETs are summarised in Table 1. 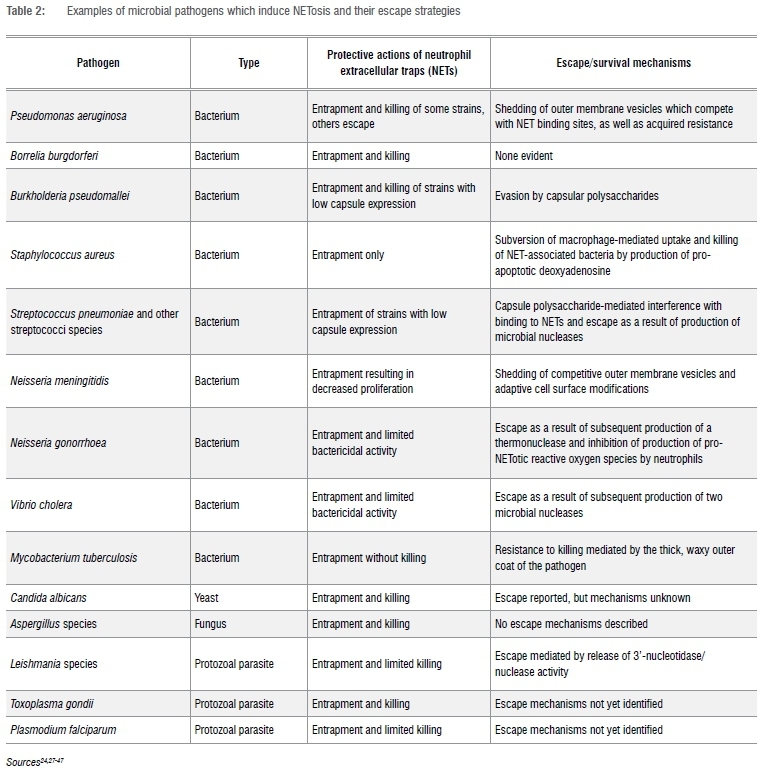 Despite beneficial effects in host defence, NETosis may occur at the expense of injury to the host.57 Inappropriate and/or excessive NET formation has been documented in the following autoimmune, cardiovascular and pulmonary diseases. NETs may also contribute to the pathogenesis and severity of several inflammatory lung conditions, including cystic fibrosis74, acute lung injury and acute respiratory distress syndrome75, severe asthma76 and chronic obstructive pulmonary disease77. 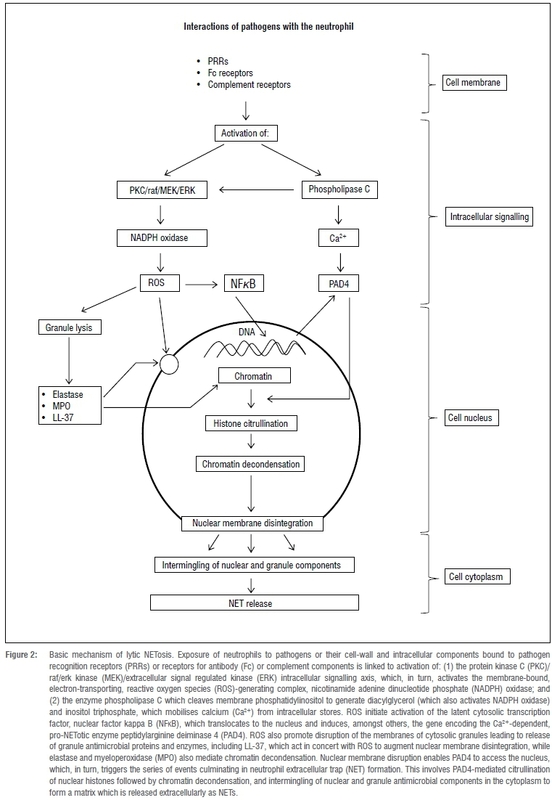 Given the apparent involvement of excessive NETosis in the development of autoimmune and cardiovascular diseases, as well as in exacerbation of CF, pharmacological regulation of aberrant NETosis has definite therapeutic potential. This potential has yet to be realised, however, due in large part to the relatively recent discovery of NETosis, as well as the current limited insights into the diversity of the molecular mechanisms underpinning this process. Possible strategies include: (1) inhibition of the generation of pro-NETotic ROS, or, alternatively, neutralisation of ROS using oxidant-scavengers such as N-acetylcysteine or ascorbic acid;11 (2) inhibitors of the activation of NFkB such as ascorbic acid and acetylsalicylic acid (aspirin), both of which have shown promise in experimental animal models of excessive NET formation11,83; and (3) inhibitors of PAD4 which are currently in pre-clinical development84. NETs appear to increase the versatility and potency of the anti-infective armamentarium of neutrophils, as well as several other cell types of the innate immune system, possibly prolonging protective activity beyond cell death, thereby ensuring maximal utilisation of antimicrobial granule proteins. However, several important questions relating to the exact role of NETs in host defence remain incompletely understood. Remaining avenues for exploration include: (1) determining the biological relevance of the various types of NETosis; (2) unravelling the precise molecular and biochemical mechanisms underpinning these processes; and (3) characterising cooperative, beneficial interactions of NETosis with other cellular and humoral components of the innate and adaptive immune systems. As with other indiscriminate phagocyte-derived antimicrobial systems, such as the generation of tissue damaging and carcinogenic ROS, the extracellular release of nuclear material and enzymes such as elastase and MPO during NETosis presents the potential threat of development of autoimmune, cardiovascular and other disorders. Balancing NETosis in favour of host defence using pharmacological and other strategies represents an ongoing challenge. All the authors contributed equally to the compilation of the manuscript, as well as to the coordination of the final version.